On a busy transfer deadline day at Fir Park, Motherwell are already celebrating a windfall of around £750,000 without selling anyone! The cash injection comes thanks to Marvin Johnson's move from Oxford United to Middlesbrough, with 'Well benefiting by the massive sum thanks to the Fir Park board's previous shrewdness in negotiating a 25 per cent sell-on clause when Johnson was sold to the Us a year ago. Although today's Johnson fee is undisclosed, it is believed to be around the £3 million mark which would net the Steelmen £750,000. 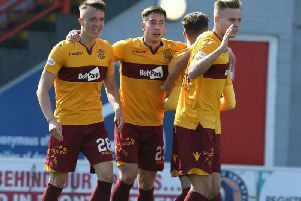 In other developments today, 'Well have rejected a £450,000 from Oxford United for Scotland under-21 ace Chris Cadden, while an English Championship club are trying to sign Motherwell centre back Ben Heneghan who yesterday was the subject of a £250,000 offer from Blackburn Rovers which was rejected. In what is a hectic day around Fir Park way, the Steelmen are in the market to sign two new players before the window slams shut at midnight. It will no doubt be a frantic few hours for Motherwell general manager Alan Burrows and manager Stephen Robinson.